As yogi’s, and as humans, many of us feel a responsibility to give back to the community, weather that be locally, nationally or internationally. One of that ways we can do this is through selfless service. In the world of yoga, selfless service is defined by the Sanskrit word Seva. But what is selfless service? SEVA, or selfless service, is an action performed without any expectation of refund or reward, the action is performed just for the simple act of helping. Every day people participate in acts of kindness – donating or working at the local food pantry, volunteering at a local organization, reading at an elementary school, visiting with nursing home residents. At Sadhana Yoga School we perform SEVA a variety of ways, both in our local communities and in the host countries where we hold our 95 hour, 200 hour, and 300 hour yoga teacher trainings. Not only do we donate a percentage of student tuition to a charity in the host country, we also offer opportunities for students to participate in karma yoga during their training so the service goes beyond just a monetary benefit. Does it come as a surprise that since 1974 volunteerism rates in the US alone vary by about only 1% according nonprofiltquarterly.org. 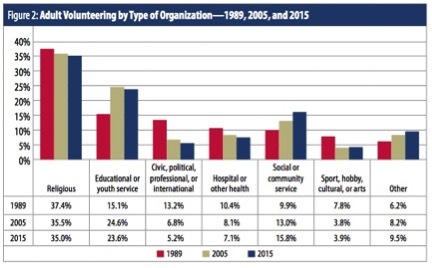 Even though overall volunteerism has not changed, the populations which are volunteering have changed, and the focus of volunteer efforts have also shifted. In general, according to nonprrofitquarterly.org, teenagers ages 15-19 alone, contribute toward about 25% of volunteer efforts and while religious organizations contribute to nearly 40% of volunteer efforts, youth, educational, social, and community service organizations have gotten a lot more attention in recent years. No matter what age you are, how much time you can give, an act is SEVA can be a one time thing, or a daily, weekly, monthly occurrence. Just remember to give without an expectation of emotional or physical return. They can provide spiritual fulfillment for the person or entity offering up the selfless service but more importantly is to just perform the act of seva without any expectation of physical or even emotional reward. When one decided to participate in SEVA, it may or may not be something you truly desire. As you may recall from a recent blog post, from Sadhana Yoga School facilitator, Brianne, Nadi, she recently stayed at Amma’s Ashram in Kerala, India. She commented on the experience of providing selfless service as part of the Amma community. In some cases, volunteerism may speak to one’s natural talents and skills, but since the goal is just to give, it should not matter if what you are doing is necessarily something you love, but rather, just offering your service toward a greater good. Are you interested in donating funds or participating in volunteerism? Here are a few resources to help you do your research. This is a useful website, designed to help you learn more about organizations you wish to support. This is a useful website to help you explore the kind of volunteerism that speaks to you, and locate opportunities in your area. Local churches, youth organizations, schools, food pantries, humane society and similar social organizations can all provide an opportunity for SEVA service.